The program is based on strong scientific research, is delivered under the supervision of a Cogmed Qualified Coach, and can be done either in the convenience of the client’s home or at a designated healthcare facility. Implemented by a national network of attention specialists, all qualified by Cogmed. Computer-based training, using a Mac or PC. Program adjusts complexity level for each exercise, in real time, for maximized training effect. Supported by a Cogmed Coach who leads the training, tracks results, and gives support and motivation. The Cogmed Program fee is based on an individual case basis and usually supplements other interventions, strategies, and trainings provided by Educational Solutions CNY. Studies consistently show that most people with attention deficits have a working memory deficit. That holds true for attention problems due to ADHD, traumatic brain injury, normal aging, or general deficits from working memory overload; it is also true for milder concentration problems. Research also shows that deficits in working memory are related to poor academic or professional performance (Read Blog Post). Conversely, strong working memory capacity is closely correlated with fluid intelligence. 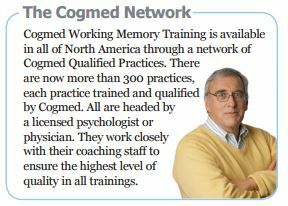 A substantial and growing body of work documents the efficacy of Cogmed Working Memory Training. Most notably, Klingberg’s 2005 study on school age children with ADHD showed it to be effective in a placebocontrolled, multi-center trial. There were statistically and clinically significant treatment effects on non-trained measures of working memory, response inhibition and complex reasoning. 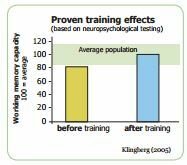 Substantial and lasting reduction of attention problems following training-induced working memory improvements is a research breakthrough. 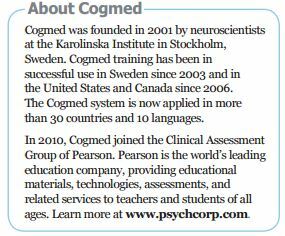 Leading American and European research teams have now replicated the research using Cogmed products and protocol. They have presented results at several research conferences. For the latest results and research posters, visit www.cogmed.com/research. 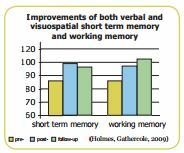 Working memory is critical for focusing, appropriately shutting out distractions, and for complex thinking. 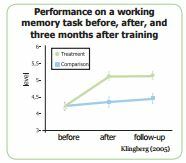 Improved working memory capacity generalizes to improved attention and impulse control. 8 of 10 users who complete training show measurable effects. 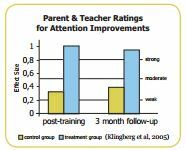 Children - Research and clinical data show improved grades following Cogmed training. Parents and teachers also report improved social skills, taking initiative, remembering instructions, and completing assignments more independently. The objective is better academic results, particularly in reading comprehension and math. Adults - By training your working memory you will be better able to stay focused, ignore distractions, plan next steps, remember instructions, and start and finish tasks. The objective is better professional performance and attentional stamina.